In the great pharmacological arsenal of Western medicine, a few drugs are so embedded in the collective American consciousness that their names alone conjure up powerful, even emotional, associations. Oxycontin is one. Plan B, another. And Accutane, while not at the root of a nationwide opioid epidemic or vilified by pro-life extremists, is arguably the most controversial medication prescribed today by dermatologists in the U.S. For many patients, Accutane seems like an oral atomic bomb, evoking images of deformed babies and horrific suicides. But for dermatology providers, Accutane occupies an almost sacred status, the gold standard for patients with recalcitrant acne, folliculitis, and a few other skin disorders that fail to respond to first-line treatments like antibiotics and retinoids. I should know: I am one such patient. 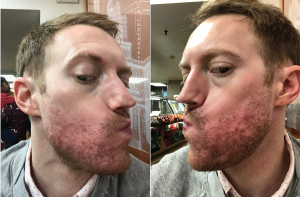 If you have read parts 1 and 2 of my “Accutane story,” you know by now that I have struggled with a rare form of folliculitis in my beard area for almost a year. 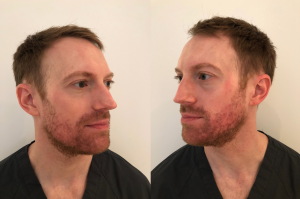 In the spring of 2017, I grew a beard for the first time ever and enjoyed a few liberating months of facial hirsutism before my follicles and I met our match: Enterobacter aerogenes. These Gram-negative bacteria, acquired most likely during a hospital rotation in my clinical year of physician assistant school, found a happy home in my beard and overstayed their welcome, to say the least. Despite multiple rounds of topical and oral antibiotics, these unexpected visitors simply refused to die. By mid-November, after three months of painful, inflammatory outbreaks, I was desperate for a different approach. If Accutane was the dermatological nuclear option, I was prepared to hit the “Detonate” button and deal with the aftermath later. To start, Accutane was the brand name concocted by Roche Pharmaceuticals for isotretinoin (13-cis retinoic acid), an oral medication that was approved by the FDA in 1982 for the treatment of cystic acne. Embraced enthusiastically by dermatologists and acne sufferers alike, Accutane—like Band-Aid, Chapstick, and Kleenex—became a proprietary eponym, in which a brand name is so successful, it is used as frequently or more than the generic object it refers to. It would be twenty years before a generic form of isotretinoin called Amnesteem was approved by the FDA. And while Roche removed Accutane from the market in 2009, amid increasing allegations of gastrointestinal and psychiatric side effects (more on this later), the brand name endures. For eligible patients now, it is usually a question of which generic “Accutane” their insurance providers will approve. I took one called Myorisan. To my knowledge, they are all more or less the same, with some manufacturers claiming better absorbency. Isotretinoin falls under the umbrella of retinoids, synthetic analogs of vitamin A. Like its sister medication, topical tretinoin—also better known by its original brand name, Retin-A—isotretinoin is a first-generation retinoid. These are the most studied retinoids, with significant research substantiating both their acne fighting and anti-aging properties. I was—and still am—a proponent of topical retinoids, long before I swallowed my first Accutane capsule. This is the part patients may actually want to hear if they are not pharmaceutical history buffs. As with so many medications I studied in PA school, the mechanism of action of Accutane is “not fully understood.” The simplest explanations I have read suggest that Accutane induces apoptosis, or programmed cell death, in various cells in the body. These include cells in sebaceous glands, which are the oil- or sebum-producing glands attached to hair follicles that are typically overactive in patients with acne. Excessive sebum can block the sebaceous gland duct, leading to a closed comedo (whitehead) or open comedo (blackhead). Then the bacteria Proprionibacterium acnes, which live deep within the follicles, feast on the sebum as their primary food source and overpopulate. Finally, the body responds to this bacterial colonization by releasing pro-inflammatory chemicals, leading to the inflamed lesions characteristic of acne. These are the classic four factors at the root of acne: 1) increased sebum production, 2) clogged sebaceous glands, 3) P. acnes overgrowth, and 4) the body’s inflammatory response. And while first-line acne medications like benzoyl peroxide, topical retinoids (like Retin-A), and oral and topical antibiotics affect one or more of these factors, Accutane affects all of them. It is the proverbial “big gun” of acne, and most patients who have been through the ringer with severe acne are ready to step up to the line of fire and accept the side effects. There are several major side effects every Accutane patient should know about, more than a few of which I experienced first-hand. First things first: it is well established that Accutane causes birth defects if taken by a female patient during pregnancy. Not long after the market release of Accutane in 1982, cases of birth defects—including cardiovascular and neurological deformities—began emerging. The New York Times reported in 1988 that over 1,000 babies had been born in the U.S. with birth defects attributed to Accutane in the six years since its release. The FDA responded by imposing stricter labels, including a black box warning, and by developing physician training materials. In 2006 the FDA launched iPLEDGE, a mandatory distribution program for isotretinoin intended to prevent use of the medication during pregnancy. All prescribers of isotretinoin in the U.S. must be registered and activated on the iPLEDGE web site. And every single Accutane patient in the U.S., male or female, must be registered and activated, as well. Women must have two negative pregnancy tests, taken 30 days apart, before even being able to start Accutane. They must declare two forms of birth control—or abstinence—and take monthly pregnancy tests, included in their routine blood work monitoring, throughout their Accutane course. Men must also get monthly blood work but are spared the requisite “Hey, Doc, I’m still not pregnant” song and dance. Ask most dermatology providers, and they will tell you that iPLEDGE is a frustrating, inflexible system that often delays patients in getting the medication they most need. Suffice it to say that birth defects are the most serious side effect for female patients of childbearing age, should they get pregnant on Accutane, but there is no evidence that Accutane affects fertility or causes birth defects once a course is completed. But what of the other side effects that perpetuate Accutane’s status as the so-called nuclear option? Without question, the most common side effect is dryness—affecting the lips, nose, eyes, and skin over all. If you are on Accutane, you will be dry, as the medication targets the very glands in the skin that secrete oil. For most patients, the dryness can be tolerable with frequent applications of lip balm, Aquaphor or Vaseline to the nostrils, lubricating drops for the eyes, and moisturizer (oil-free!) to the face and body. Patients may experience dryness severe enough to evolve into a rash (often on the tops of the hands), for which mild topical steroids are effective. While dryness on Accutane is inevitable, other side effects are highly variable. Among the more common side effects include elevated triglycerides and cholesterol, so a lipid panel is included in every Accutane patient’s monthly blood work. Providers often recommend taking fish oil supplements containing omega-3 fatty acids, which may help to lower cholesterol levels. Other common side effects include headache, nausea, vomiting, and muscle and joint pain. But the “big ones,” the side effects that patients most worry about—and which, unfortunately, scare away many ideal Accutane candidates—are also the most rare and highly debated. Accutane has been associated with both gastrointestinal disorders (namely inflammatory bowel disease and ulcerative colitis) and psychiatric disorders (including anxiety, depression, psychosis, and suicidal ideation). In both cases, however, causation has never been demonstrated, after numerous case studies and lawsuits. The possibility of rare idiosyncratic adverse effects does exist, but patients should be reassured that Accutane is not a straight ticket to IBD and suicidality. The most important guidance patients should receive is to notify their provider immediately if any unusual or worrying side effects occur during an Accutane course. The dosage can always be decreased, or the medication discontinued altogether. By the time I popped my first Accutane pill on November 13, 2017, I was in pretty rough shape, to say the least. My folliculitis had come back with a vengeance and was redder, crustier, and “angrier” than ever. To make matters worse, I was scheduled for the Physician Assistant National Certification Exam (or “PANCE,” as it is known to all us PAs) on November 20, and my stress level was through the roof. My PA program had none too subtly emphasized the importance of students passing the PANCE on the first attempt, and one classmate had already failed. The fear of disappointing my school, my family, and myself haunted me. I took two weeks off from work—and, effectively, my relationship—to hunker down in my room and become something of a reclusive robot. Subsisting largely off coffee and Chipotle burritos, I answered hundreds of practice exam questions every day as if my life depended on it—and it did. Having taken a leap of faith six years earlier to pursue a career in medicine, I felt like the PANCE was more than a certification exam: it was symbolic, a validation of all that I had worked so hard for. The good news is, I passed. On November 28, I became a certified physician assistant, or “PA-C.” I was exhilarated—and relieved. The bad new is, my skin had suffered from the enormous stress of this time. If a photo can say a thousand words, my face in photos from this period is silently crying out for help. 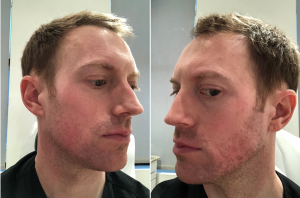 The first change I observed with my skin on Accutane was the same as every other Accutane patient since 1982: dryness. It seemed like within hours of taking my first 40 mg capsule, I was reaching for a sample-sized tube of Aquaphor ointment I had snagged from the office. And while some patients don’t experience dry facial skin, my face became dry almost immediately. If I even lightly rubbed my face, I could expect a mini snow shower of dead skin flakes. For facial dryness, I relied heavily on a light, oil-free moisturizer called Cerave PM Moisturizing Lotion. Throughout my six-month course of Accutane, I kept sample sizes of Aquaphor and Cerave PM in my pockets at all times. Thanks, Spring Street Dermatology sample closet! November and December were slow going in terms of progress. This should have been expected, having talked with hundreds of Accutane patients at the practice. Most patients don’t see an appreciable difference until the third month of treatment. But first comes the “purge,” when all the old skin cells start rising—at an accelerated rate, with a potent retinoid—from the bottom layer of the epidermis up to the surface. “It gets worse before it gets better” is the adage. (There should be a framed cross-stitch of this in every dermatology exam room in America. I might market that.) In my case, things simply could not get any worse than they were in mid-November. It could only get better, and I relaxed into that certainty, despite some rather gnarly eruptions. By February 2018, things were better. The purge was over, and my skin looked decidedly less cystic, inflamed, and “angry.” There were still breakouts, but fewer and less severe. My dose had been increased to 40 mg twice a day, where I would stay for the remainder of my course. But with higher doses of Accutane comes the risk of more pronounced side effects. In my case, I started developing back pain. I was slow to make the association with Accutane. For at least a month, I was convinced that alternating sleep on two different mattresses—mine and my boyfriend’s—was the culprit. I even suggested that he purchase a new mattress. “IKEA mattresses are horrible!” I pleaded. (They are, actually.) Alejandro politely dismissed my request. But as the pain evolved, migrating down my cervical spine into my thoracic and lumbar spine and hips, I had my “Aha! moment” and shifted the blame from IKEA to Accutane. 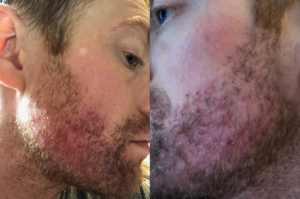 March was a “good month,” when I could say without any hesitation that Accutane was working. When my mom came up to New York for a springtime visit, I looked—and felt, on an emotional level—better. My Accutane glow was borderline radioactive, but I was visibly happier and relatively clear. But there was never a day when I was totally clear. I continued to wake up every morning with the hope that “today is the day,” the tipping point, when my breakouts were behind me. 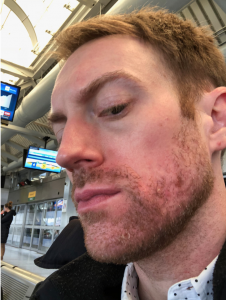 Despite marked over all improvement, there were always two or three infected follicles in my beard—painful, inflamed, angry. Accutane was shutting down the oils on which my nemesis bacteria lived, but they were still holding on, surviving through the famine. 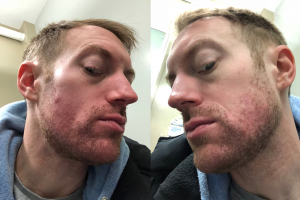 The real kicker came in in late April, when I had one of the worst breakouts since starting Accutane. 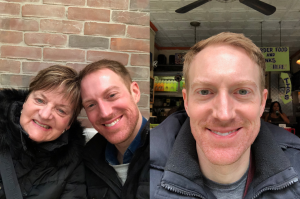 I frantically texted a barrage of selfies to Dr. Mikhail—on a weekend, no less—and wrote, “This is what I look like after five months of Accutane.” I felt like I had gone backwards when, all along, I had believed in the inevitability of upward progress on Accutane. She was reassuring, as always, urging me to stay the course. And this is exactly what I did for the months of May and June, as I edged toward my maximum cumulative dose. I took my pills and “let go and let God.” There were some emotional lows during this time, particularly when I went to my friend Rachel’s wedding in early June. In every photo of myself from that weekend, I look as red and inflamed as ever. How could my skin revolt on my like this, after months of improvement? 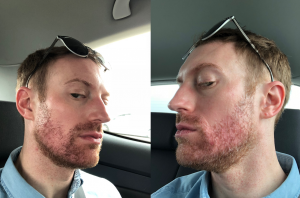 By mid-June, Accutane and I were done. It was time to break up. I had surpassed my maximum dose of 11,250 mg and taken 13,200 mg cumulatively since November. I had also paid nearly $400 out of pocket for the last month of treatment, as my crappy insurance denied coverage. My overtaxed liver, aching hips, and empty wallet needed some time to recover. 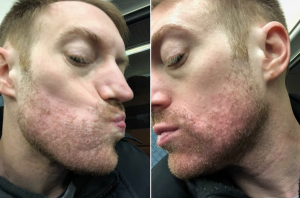 Frustrated with continued breakouts, on June 22 I decided to take matters into my own hands and do a repeat bacterial culture, swabbing what was a fairly characteristic pustule. Five days later, the report came back: “Enterobacter aerogenes, moderate growth.” My Gram-negative bacterial friend had made it, after all. Rather than feeling disappointed, however, I was surprisingly relieved. I knew definitively what the problem was and what it had always been. I scrutinized the antibiotic sensitivity report like I was studying for the PANCE all over again. I also consulted every single dermatologist in the office to construct a game plan. One of the doctors suggested a topical form of the antibiotic gentamicin. In PA school, I had only learned of its IV form. So it was another “Aha! moment” to learn not only that a topical form existed, but that it was active against Gram-negative species like Enterobacter. For safe measure, I decided to go back on the oral antibiotic that had cleared me in the first place: ciprofloxacin. Only this time, my boyfriend Alejandro—who had broken out consistently right along with me all along, if to a lesser degree—would be joining me in a combined mission of all-out antibiotic warfare. For two weeks, we slathered on our creams and took our pills, routines that became as familiar as brushing our teeth. It seems obvious in retrospect, but for months we had unwittingly engaged in a kind of bacterial ping-pong: if one of us was flaring, it was only a matter of time before the other would flare, too. 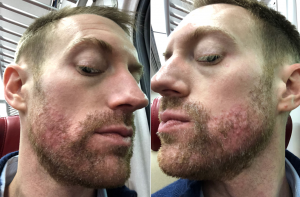 Despite the major improvements with Accutane, I was never going to clear—and neither was Alejandro—if we didn’t both combat the causative organism at the same time. For any readers suffering from a stubborn or seemingly resistant folliculitis, consider if you might be passing the bacteria back and forth with your partner. Within days, we both began to clear. 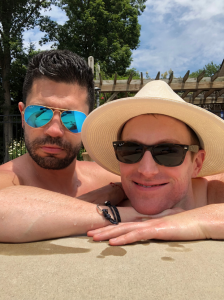 We would cautiously check in with each other, “Are you breaking out?” After about a week, the answer for both of us was, simply, “No.” That was an historic moment, for neither of us to be experiencing a breakout. I am still hesitant to exclaim, “I’m cured!” I was clear briefly before, and it all came back again, likely due to the decidedly not fun game of Gram-negative ping-pong. For now, I am appreciating each day that I wake up, greet my face in the mirror, and am not dejected and defeated. It is now July 29, almost a year to the day that I first realized that something was terribly, terribly wrong with my face. Call it my year of dermatological hell. It was a complicated diagnosis, one that stumped and stymied numerous dermatology providers—me, most of all—and required a multi-pronged approach to eradicate. And while Accutane didn’t wipe it out by itself, it forever changed my oil production, decreased the bacterial load, and set the stage for antibiotics to work more effectively this time. (Not to mention, I don’t even remember what a blackhead on my nose even looks like.) Am I glad I did it? No regrets here. I am left with significant scarring along my lower face, where continuous inflammation wreaked havoc for so long. Of course, I hate that. Fortunately, I work in an office with access to lasers and other cosmetic treatments that are effective for scarring. I won’t be able to do any of these for a while, as skin continues to be sensitive for six months to a year after Accutane. I will get there—and more on these in future blogs. For now, I am happy to be clear, to feel a weight slowly lifting off my shoulders, and to share my story with patients and readers. Severe acne and folliculitis are debilitating conditions and should not be marginalized. I know this all too well now—I have been there. But with determination, persistence, and the right medical treatment plan, it can—and will—get better.